Whether you want to look historically accurate or imitate one of the many movies, a Robin Hood costume pattern is easy to procure or even make yourself. You can buy one or even find one for free on the Internet. Depending on your sewing skills and work time, you can make something that might give some of the film costumes a run for their money. Although different films and TV shows have aimed for various levels of authenticity, resulting in a wide variety of looks for the famous outlaw, there is a standard costume that is immediately recognizable as Robin Hood. A forest-green tunic over a loose white shirt that laces up the front, either tights or leather trousers, knee-high boots, a dagger in the belt and a small, triangular hat, often with a feather in the brim are the most common aspects. Child or adult, male or female - if you put on this costume in some variation, everyone knows who you are, whether you have a Maid Marian with you or not. The pattern for this costume is one of the more easily available - during the Halloween season, you can find them from Butterick, Simplicity and all the standard pattern makers. You can also find something more historically accurate that still has the same look from costume pattern sites that specialize in medieval clothing. 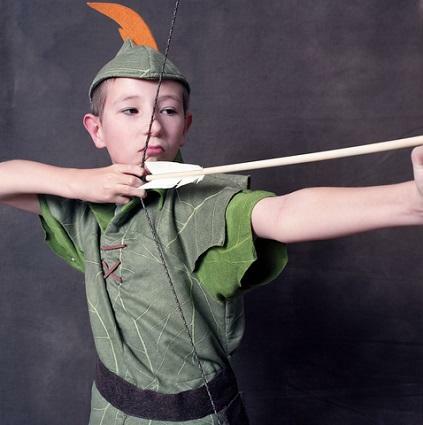 While it's very easy to find Robin Hood costumes for sale, ranging from cheap pieces to elaborate recreations, finding a whole pattern for an adult that isn't from one of the main costume companies is a bit trickier. The Costumer's Manifesto, which offers dozens of links to pattern sites as well as useful images to study to help you design your costume. For a free pattern for a simple child's costume, go to Michaels. The craft shop not only makes a pattern available for download, it also has all the necessary items to make the costume, so you have the ease of one-stop shopping. For someone with experience in sewing, it may be preferable to construct your own Robin Hood costume pattern from the ground up. The best way to do this, of course, is to consult a number of images from the period so as to build an accurate design. Start your research with The Costume Gallery, which has images, links, recommended books and videos and a host of other useful information for everything you want to know about clothing from 100 to 1499, which covers Robin Hood nicely. You can vary the look and add details as you see fit. Remembering that he was an outlaw who lived in the woods can add color to your costume. It should not look too new or perfect. A little dirt and some ruggedness will go a long way to augment the authenticity. Robin Hood was dashing, but he was also a swashbuckler - neatness does not go with the territory. You might also add a bow and arrows - although unless you know how to use them, you should probably leave them strapped to your back.